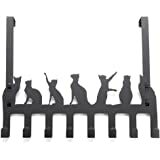  CAST IRON WALL HOOK RACK FOR COATS, HATS, KEYS, TOWELS AND MORE - Organize your home in style with our metal wall rack with 7 hooks. Use these decorative wall hooks in your doorway, on your door, bedroom, hallway, kitchen, patio, garden or cabin.  RUSTIC, VINTAGE, OLD FASHIONED DESIGN - Our cast iron hanger can be a great addition to your home décor. Wow yours guests or give this item as a present for Christmas, Birthday, Wedding, House Warming Party and More.  HIGH QUALITY, SOLID, AND HEAVY DUTY PRODUCT - This decorative wall hook is a solid piece, crafted recycled cast iron. It will last for generations. The coat hanger is covered with special coating, giving the item vintage or rusted look, while protecting the item from rust and wear.  CONVENIENT AND EASY TO USE - Attractive design of this item does not make it only a decorative piece. Thick, rounded edges will not damage your clothes. Easily mount this coat rack on your wall with included screws and anchors. 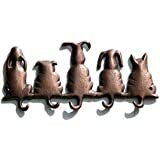 Compliment this wall mounted coat hooks with our selection of other cast iron décor items. Add character to your entry way, door, bedroom, bathroom, patio, cabin or garden with our metal wall rack. Made from recycled cast iron and decorated with a vintage, antique-like finish, these wall hooks will be a jewel of your home décor and a conversation starter. These old fashioned wall hooks are decorated with vintage ornaments to give your home a warm, sophisticated look. The 7 Cats Design adds character to your home, while the rustic finish reminds us of an old-country charm. 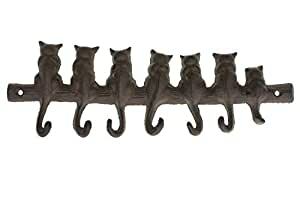 Use this decorative wall hook as a coat hanger, hang your hats, dog leashes at the entrance, use it a key holder for your car and house keys, hand your towels or bathrobes in the bathroom, store your mittens and towels in the kitchen. This is great for any home, cottage, beach house or patio! A great gift is useful, has character and can last a lifetime. Our coat hanger can be used any day while bringing charm and character to a special home. The vintage wall hooks are durable, artisan and unique. 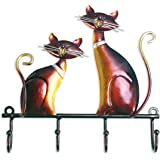 These wall mounted coat racks will make a wonderful gift for a birthday, Christmas, wedding, house warming party, Mother's Day or just because you care. Mounting the metal organizer with hooks on your wall is super easy with included screws and anchors. This is a very good keyholder but it has one downfall. The good part is that it is just as described. The seller also provides wall anchors that are better than what is normally sent with this kind of item. The wall anchor has a very good "bite" into the wall as you push it in. No worries about it every coming loose. However, it does have a downfall as I alluded to above. The keyholder has some type of coating on it that you need to wash off. In my case I did not know it and so it transferred to my wall when i placed it up against the wall to see where i wanted to put it. It marked my wall and it took some effort to remove it. Wash yours first. Other than that its all good. This is cute, but it isn't all that great to actually hang anything on. 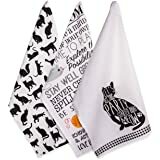 I got it to hang by my bathroom sink, so I could hang my glasses from one of the tails while I wash my face at night, and to hold other little things while I get ready. It seems to me that this is more for decoration than it is to be used as something functional. I hung it with a level, however, the decreasing length of tails makes it appear visually crooked. It has a substantial weight - I only wish it worked better. I'm sure it can handle quite a bit of weight...but I'll never know. Everything I try to hang on it just slips off - and that includes washcloths and even a shower pouf with a thicker than normal hanging rope. This might be fine for hanging keys that are on a round metal key ring, but if you have many keys on the ring, forget it. Cute idea - needs a little better execution. There are many better options on the market. 5.0 out of 5 starsVery cute and practical! I get so many compliments on this key hanger! I have been using it for about 6 months now, and I haven't had any issues with it at all. It's very heavy duty, which at first made me nervous that it might tear up the wall, but it has been great! It holds a lot of weight, and even with people pulling on it all the time while trying to grab their keys in a rush, it stays firmly in the wall. Not to mention that it's so cute! The only thing you should know is that the hook all the way on the right is pretty short and seems more for decoration, so it doesn't really hold keys. We've never had a problem with it because we only use a few hooks at a time, but if you're buying this hoping to utilize every single hook, you may have trouble with the last one. I would definitely recommend this item! It is absolutely adorable. However I sent mine back. The picture appears to have a purse hanging but the hooks won't hold a standard size strap. I very disappointed. I really liked it but it just wouldn't hold anything unless it was really small. Would be great for keys and umbrellas. 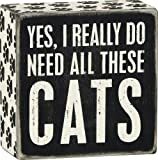 I bought this as a gift for a crafty cat loving friend, she loved it. 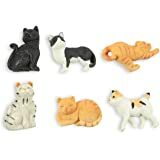 I was disappointed by the shipping however, the tail on the 'largest' cat was broken off, I'm assuming it happened in transit. Thankfully a soldering iron will fix it easily without any ugly seams. Its a pretty decent size about a foot long and less than 4" tall (the posted dimensions are accurate) the hooks are better for keys than coats, maybe scarfs? Still a nice unique fixture for your home.